Good ambience.The property has a good feel to it.The staff was very courteous & friendly.Good and comfortable rooms.The restaurant serves some really good food.Perfect stay. Very nice experience.Friendly & cooperative staff.Rooms were also clean & spacious.The complimentary breakfast was really good.Recommended for sure. Pleasant experience as always at Roa.Staff is very friendly and rooms are clean and maintained.Food is also amazing. They had offers on food for in house guests. Location is also very convenient. Good ambience.Friendly staff. Nice and comfortable rooms.Food was exceptional.Location was convenient as well. Worst experience ever had with Hospitality of hotel. Service is very worst. I had booked executive double bed room with extra bed, they have charged for extra bed but they provided only mattress and after asking I have been told that they don't have beds. I am very surprised indirect this people were asking me to sleep on floor after paying a handsome amount. Also there service is very slow either they are not interested to provide hospitality or they might have hearing problem. Good location, very cooperative front desk and room cleaning staff. Very pleasant calm & quiet atmosphere, safe to saty with family. My total experience on ROA hotel was excellent and worth for the payment. Great value for money. Dinner is very good and affordable. The Staff is very polite and helpful, they go great lenghts to satisfy guest needs. Would definately stay again, the dinner on itself makes the stay already worthy. The Roa Hotel This rating is a reflection of how the property compares to the industry standard when it comes to price, facilities and services available. It's based on a self-evaluation by the property. Use this rating to help choose your stay! Tastefully decorated, rooms feature modern interiors and floor-to-ceiling windows that offer natural sunlight. They are well equipped with a kettle, seating area and safety deposit box. Shower facilities are in the bathroom. Flava Restaurant serves local and international favorites, while fine wines and refreshing cocktails are offered at the bar. Outdoor dining options are also available upon request. Staff at the tour desk can assist with ticketing and car rental services. Same-day laundry and ironing services can be arranged. Hotel Roa is 1.9 mi from Phenix Market City Mall and a 20-minute drive from Bandra Kurla Complex. Mumbai International Airport is a 30-minute drive away. 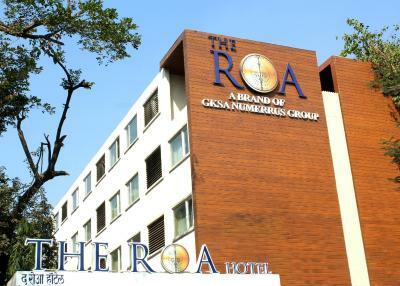 When would you like to stay at The Roa Hotel? Air-conditioned room offers a flat-screen TV, floor-to-ceiling windows and a private bathroom. Fitted with modern interiors and warm mood lighting, this air-conditioned room features a flat-screen TV, floor-to-ceiling windows and a private bathroom. House Rules The Roa Hotel takes special requests – add in the next step! The Roa Hotel accepts these cards and reserves the right to temporarily hold an amount prior to arrival. Very clean rooms and comfortable beds. Breakfast to be changed every time repeat food is there.. Now I can also tell you the menu for which day.. The Ambience is good and food is also good . Good in all sense. Good staff good atmosphere, safe, secure, calm and quiet. The place is a bit pricey. Buffet breakfast available only if occupancy rate is high. Ala carte breakfast available with limited choices on other days. Toilet felt a little cramped. Excellent location, friendly staff, quick check-in/out process and sumptuous food at the restaurant. Overall, a great place to stay. Highly recommended.